The Aureal make up one half of Sheogorath's army, along with the Mazken. The two groups have a great rivalry, each believing they are Sheogorath's favored. The Aureal are charged with guarding Mania. In times of peace, they act as guards, patrolling the realm for criminals and hostile creatures. 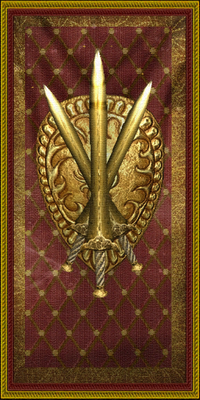 In times of war, they favor swords, war-axes, their golden heavy armor, and are placed under the command of the Duke of Mania. Like many Daedra, they are commonly summoned to Tamriel. Some Golden Saints are also said to reside in the Colored Rooms. They are not to be confused with the Aurorans, another humanoid Daedric species with golden armor and uncommon skin tones. Battlespire concept art included a design for an angel-like Spirit Daedra, which went unused in the final game. It is possible that the concept would later be redesigned into a the Golden Saint. For game-specific information, see the Morrowind, Shivering Isles, ESO, and Legends articles. This page was last modified on 14 January 2019, at 00:44.